This chapter shares an Authentic and Culturally Engaging (ACE) Service-Learning framework as a pedagogical approach in equipping teacher candidates with the knowledge, skills and dispositions to be successful in-service teachers in diverse PK-12 school environments. As PK-12 schools become more racially and culturally diverse, there is a need to better prepare teacher candidates for diverse school environments, especially given that many teachers have asserted that they do not know how to teach diverse students. The chapter highlights components of the ACE framework and suggests practical strategies that teacher educators can use in integrating this framework into their courses. The end of the chapter focuses on teacher educators and how they can engage in a relearning process to unpack their previous knowledge regarding social justice and multicultural education in an effort to prepare their teacher candidates for diverse schools followed by a suggested checklist applicable to any teacher preparation course. Our world continues to evolve into a heterogeneous global village consisting of multiple cultural, religious, economic, racial, ethnic, and linguistic groups, interacting and connected with each other. This global village phenomenon has emerged, which, if translated to show the earth’s population shrunk to a village of 100 people (Kastle, n.d.), would reveal a village comprised half of females and males, showing diversity in groups outlined below. The village would consist of 61 people from Asia, of whom 19 would be from China, and almost 18 would be Indians (from India), there would be 15 people from countries in the African continent, 10 individuals from Europe, not quite 9 would be from South America and the Caribbean, and 5 from North America. Somewhere among the Americans would be the world's most powerful man, the U.S. president. Their native language would be: 12 would be speaking Mandarin Chinese, 5 would speak Spanish, 5 would speak English, 5 would speak Hindi or Bengali, 3 would speak Arabic, more than 2 speak Portuguese, 2 speak Russian, 2 speak Japanese, and 1 speaks German, the rest of the villagers can choose one or the other of the 6000 languages spoken on the planet. 33 would have a Christian background, 22 an Islamic one, almost 14 would be Hindus, there would be 7 Buddhists, and 2 would be atheists (So, let's have a look at our International Community, para. 2). Many, if not most, countries are no longer a homogenous society, as the diversity in their population increasingly demonstrates the concept of a global village. As classrooms are microcosms of society, these global demographic patterns are reflected in PK-12 institutions with culturally and linguistically diverse student populations. Consequentially, this means teachers within these schools need to be culturally aware, conscious, and accepting of their diverse students, and furthermore, culturally competent to teach these students. 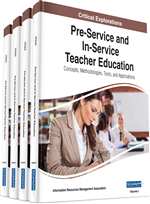 In this chapter, the author calls for the need for every Teacher Education Preparation (TEP) program to engage their teacher candidates in a minimum of one service-learning experience as a method for preparing them for diverse classroom environments. Of more importance is the type of service-learning opportunity for teacher candidates. TEP programs need to adopt the Authentic and Culturally Engaging (ACE) Service-Learning framework to engage and empower teacher candidates to be culturally competent, conscious, and accepting. The chapter begins with an overview of racial and cultural diversity within global society, with a focus on United States schools sharing the treatment and experiences of students of color in PK-12 public schools. It highlights the disparities in academic “performance” between students of color and White students, and illustrates how numerous White teachers have asserted that they just don't know how to teach students of color. Next, as a response to some White teachers inadequacies to teach students of color, the chapter highlights how service-learning as a field experience, supplemented by student teaching, can be used to preparing teacher candidates for the realities of PK-12 school environments by differentiating between community service and service-learning. The chapter then illustrates how the ACE framework is used in equipping teacher candidates with the knowledge, skills, and dispositions to teach and interact with students of color by explaining seven components of the framework with practical tips for teacher educators. Finally, the chapter concludes with suggestions for teacher educators to support their teacher candidates and a checklist to guide their practice as they infuse the ACE approach into their courses.